A representative from Swedish developer DICE said that all of the brouhaha over the Taliban hurt Medal of Honor's critical reception. Many people didn't like the fact that EA's reboot of Medal of Honor named the force opposing Americans as the Taliban in multiplayer matches. Even more people didn't like it when EA caved and removed the reference. All of the controversy in the videogame press in the months leading up to the game's release in October definitely hurt the review scores that the game received, according to Patrick Liu from DICE. 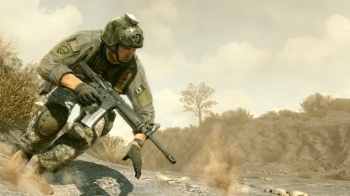 DICE designed the multiplayer portion of Medal of Honor, while Danger Close handled the campaign. Liu said that even though the reviews have not been awesome, he is committed to making the MoH franchise all that it can be and thinks that this game was a successful start. "The controversy did affect some reviews," Liu said. "It stirs a lot of feelings, just the setting." Liu is referring to setting the game in the current conflict in Afghanistan as opposed to the battlefields of World War II that were the hallmark of the original Medal of Honor released in 1999. "That does affect people's judgement," Liu said. "But otherwise, this is a reboot of a franchise. It's an investment for EA as a company. We need to build upon what we have achieved so far and improve and build up the franchise again from scratch, basically. In that sense, I think we're off to a very good start." The competition in the shooter genre was another reason that Liu thinks the reviews averaged so low. "We're in a very competitive genre," he said. "We're also competing with ourselves. Obviously we're competing with Call of Duty. It's a very tricky situation to be squeezed in between those giants." As he points out, it's a strange situation for Liu and DICE to help make a game that competes with their own franchise, the similarly themed Battlefield. "It can feel awkward sometimes," Liu said. Given that, it's not surprising that Liu balked at helping to make another MoH game, saying that he both would and would not like to do so. "It would be cool to continue to develop the franchise. At the same time we have a lot of exciting stuff going on in DICE as well that we have been working on in parallel," Liu said. That sounds like a polite way to decline. What do you think?